Today we sit and wait for hurricane Isaac to pass us by, which it is doing very slowly. We were lucky that it went farther west of us than originally thought. Even though the eye is not hitting Mississippi, we are still getting a lot of rain and also quite a few tornado warnings. We already have a few branches down and the worst has not reached us yet. One of our biggest concerns during the storm is the possibility of losing power. We are stocked with food and water, but without power or toilets will not work since they are on a pump system. We think of it as the dark toilet monster. 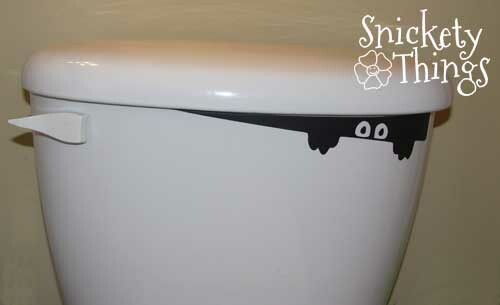 I thought I would have a little fun with the idea by making it appear the toilet monster is peeking out at us. We put it on the girls' toilet without them knowing we did it. They both screamed a little when they saw it, but immediately started laughing. They love it and are trying to think of a name. I just cut it out of black vinyl with my Silhouette and put it on. It adds a touch of fun to that room. We must have the same sense of humor! 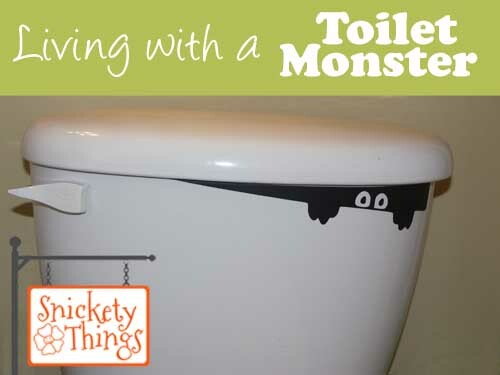 I laughed and immediately imagined surprising my children with a "toilet monster." It's a perfect decoration with Halloween just around the corner! My girls just love it now. They think it is really fun. Thanks for stopping by! Oh! That is so cute!! You are such a fun mom! I love this idea!! Cute!!! And this would be super for Halloween too! I agree! I do have some other ideas coming up for Halloween.